The first thing she did, before even giving herself time to recover, was come back to the place where she had left him. She was greatly dismayed when she could not find him. She found the corpse of the abomination that he battled, but at the spot where Kurtis had fallen there was nothing but a large pool of blood, and in the middle of it, his wondrous weapon, the Chirugai. Lara picked it up and when she did, the disc suddenly began to faintly vibrate in her hand and started to pull her away. She arose and turned toward where the disc led her, but then its blades retracted abruptly. Before her awaited looming darkness. Lara clutched the Chirugai in her hand and smiled. She didn’t fully understand what it all meant, since she knew as little about that strange magic as she did about its owner. Despite this, she knew in her heart that no matter how serious his wound, he was out there still alive, and he was calling for help. The adventurer went into the darkness, following the lead of the Chirugai, searching for Kurtis Trent. After the ordeal in Prague, Lara returned to her Manor. Winston could see that she was upset and moody, and understandably so; after all, the French police were still handling her as the number one suspect for Von Croy’s murder, since they had no other suspect in the Monstrum case... but it seemed as though she didn’t care about that. What was she supposed to tell them? That the Monstrum were actually two people, a fallen angel and an 800-year-old alchemist? That both of them were now dead and, even worse than that, she was the one who killed them? Not a very convincing story, but Winston didn’t need explanations. He knew Lara very well and everything she said could be trusted; when it was all said and done, she was far more like a daughter than an employer, and in the past he has heard far more outlandish things from her for him to question her on this. But now she seemed to dwell in another world, spending her days examining that weird star-shaped bladed disc she’d brought with her from Prague, waiting to see if it moved. But the Chirugai was motionless, cold. Since its last vibrations at the Strahov - drawing her towards a possible path - it hadn’t shown another signal. It was dead, and so was its owner – as far as she knew. A sound woke her from her thoughts. She jumped off the couch and answered the door before Winston, troubled by age, could reach it. None other than Marten Gunderson, the Cabal Mercenary Leader, greeted an astonished Lara by aiming a gun at her face. “Leave us, Winston,” Lara ordered while staring down Gunderson. “Where is he?” the killer asked. “Get out of my house!” She commanded, and went to close the door, but before she could he turned his gun to Winston. Lara didn’t let him finish. As the mercenary was looking at the butler, she kicked him in the crotch. The hefty fellow lost his breath for a moment, so Lara took advantage by struggling with him for his gun and managed to wrench it from his hands. Then Winston hit him on his bare head with a nearby placed candelabrum. Marten Gunderson, commendable mercenary who had been Kurtis’ boss at the Agency, disgracefully fell unconscious to the floor. When Gunderson recovered he was tied to a chair, with Lara scornfully glaring at him and playing with his unloaded gun. Winston watched them with the candelabrum nearby, just in case. “I don’t believe you,” said the killer, showing a nonchalance that didn’t match his pathetic situation. Gunderson exploded in grotesque laughter. “What’s so funny?” Lara asked, feeling suddenly annoyed. “How much do you want for him?” the killer asked. Gunderson sneered, and then suddenly jumped towards her though he was still tied to the chair. Lara easily avoided his attack, causing him to fall to the floor again. “May I hit him, miss?” Winston asked, poised with the candelabrum ready to strike. Lara was tempted to say yes, but she knew it would be pointless. She took a knife from her boot and cut through Gunderson’s binding. He seemed to consider listening to her before attacking again. Winston smiled. That was his girl! He didn’t know much about this Kurtis, and he was sure that finding about him was only going to spell more trouble, but that man had no right to break into the house and target Lara. And she pointed the door with a simple wave of her hand. Could anything be more humiliating? Marten Gunderson himself tossed onto the streets like a naughty child! He left, and then Lara slammed the door with a bang. Winston nodded, but in fact he doubted the authorities would pay attention to rants about alchemists and fallen angels. Well, Lara would handle it. She was very clever; she had always been. Lara spent the next couple days with the Chirugai hanging off her belt, waiting for the slightest sign of movement. She, who had found lost treasures, who had discovered the most hidden places... and she didn’t know how to find a man. Her only hope lay in an object that showed, like a cardiac monitor, the vital constants of the only one able to operate it. Von Croy might have laughed at her...or no, she thought with sadness, because her mentor had ended up being murdered by a creature that he himself would have written off as mythical in his youth. Three days after Gunderson’s visit, the Chirugai began to move again. Lara was sleeping when a sudden bang in the closet woke her up. Before asking herself what that was, her natural instinct already reacted: she jumped out of bed, took the gun that was always under her pillow - a personal habit that the pacifist Winston hadn’t been able to break her of - and crouched down. She ran towards the closet and opened it, and there was the blade, open and nailed in the closet’s door, as if trying to escape. She put the gun aside and took the disc. Apparently the weapon noticed her and began to vibrate again, smoothly pulling her arm away and in a different direction. Lara drifted, following its path, until she finally stopped at the manor’s iron gates. She realized it was pointing to the East. 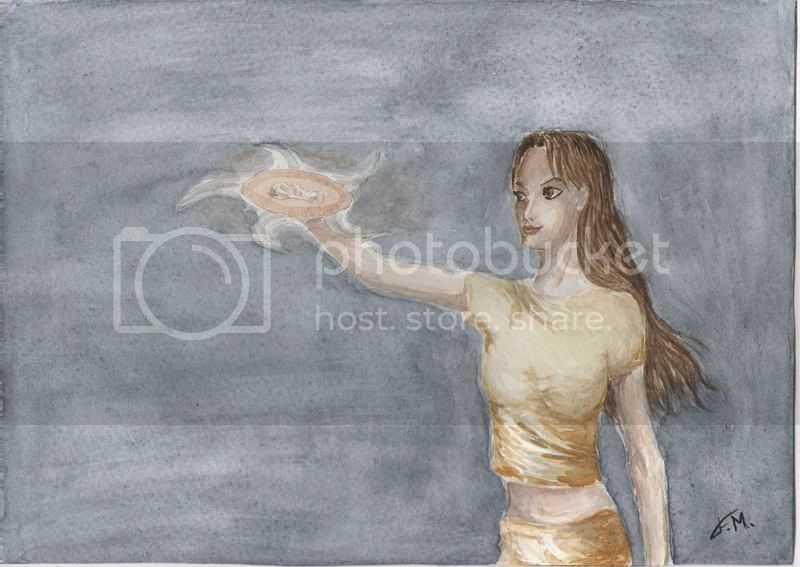 But the Chirugai didn’t seem to agree, as it kept on pulling her and began to cast a slight sparkly orange hue... was it her imagination, or did it’s energy seemed renewed? The East...what was in the East? While she mentally ran across that direction, she remembered the words of that Cabal’s scientist, Grant Müller, before he sprayed her with insecticide. We already have the last vital element from Turkey here in the Strahov. The only true remaining Nephilim. The Cubiculum Nephili, the Sleeper. If it wasn’t there, it hardly could be elsewhere. And the Chirugai, satisfied, retracted its blades and went still. Its mission, for the moment, was fulfilled.